ABR Trails – Page 271 – A full service ski touring center located on over 1100 scenic acres of varied terrain along the Montreal River in Ironwood Michigan. This year ABR will again be hosting the Midwest Grooming Clinic. The format will be set up a bit different this year. We will have the standard grooming clinic, like we have had the last 4 years, on March 1-2, 2005, Tuesday and Wednesday. We will also have a one day “hands-on” Workshop on January 11th, 2005, Tuesday. The workshop will be limited to 20 people and once the Tuesday Workshop is full we will schedule one for Wednesday, and Thursday if needed. What is a Grooming Clinic? For those of you who have not heard of the Clinic, let me try to describe it as a combination of a Clinic, Seminar, Workshop, Trade Show, and Show and Tell. You can take part, demo equipment, exchange ideas with the pro’s and vendors or you can browse the demo’s and watch and listen to the presentations. Groomers from the most experienced to novices are invited and have attended. Even veteran groomers will learn something if they keep an open mind. Speakers are invited from all over the country. Dress warm for the outdoor mornings and cooler for the afternoon indoor talks. Don’t forget to bring your ski clothes! What is a Grooming Workshop? The workshop is a new format for this season. We will limit participation to 20 groomers/day for more individual attention and smaller group size. You can watch, listen, take part, demo equipment, and exchange ideas. Vendors are not being invited to display or sell equipment at the workshop, but will be attending the Clinic in March. The purpose of the Workshop is more grooming oriented and not sales or trade show based. All of the snowmobile pulled grooming implements will still be available for demo along with 3 – 4 models of snowmobiles. A Snow Cat with a blade and renovator will also be available. We will concentrate more on beginning grooming. There will be an indoor session on the SWT and implement wiring and steering improvements. There will also be a chalkboard discussion on grooming techniques using the snowmobiles and implements. The cost for the March Clinic is $150/person, or $175 if registered after January 1, 2005. This includes rolls and coffee and lunch both days and the March 1st dinner. The cost for the January Workshop is $100/person. This includes rolls and coffee and lunch. We will have free ski rentals and beginner ski instruction for all registered participants. Book your lodging and ask for the groomers discount. This tentative schedule is being developed and details and specifics subject to change. Watch the website for updates. The general time slots will remain the same. March Clinic Vendors to be confirmed. Bombardier by Aspen equipment with a Bombardier groomer? Tidd Tech with the NEW G2 groomers and new innovations? 6. 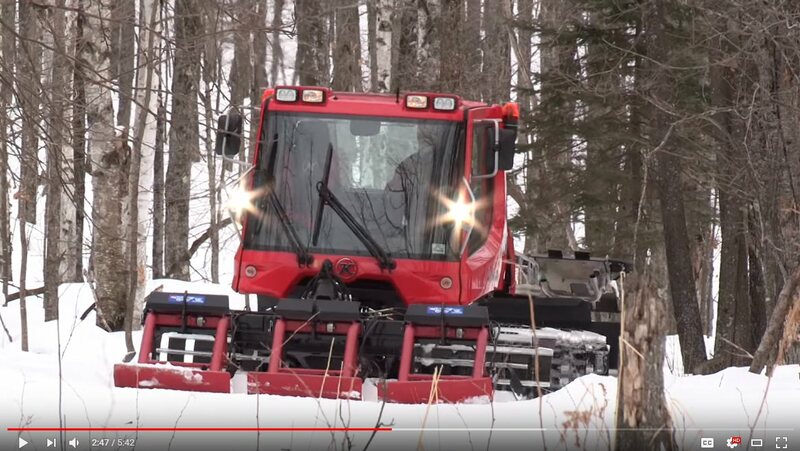 Xcskigroomers with the NEW Sno Razor groomer and cutter bar? 7. Ski-Doo by Ave’s Sport Center? 10. Northland Equipment with Arctic Cat and John Deere? There were many sales as a result of the Clinic. Vendors did sell their demos and we are encouraging this year’s vendors to load up their trucks and trailers for the Clinic. The heated “Race Building” will again house tables for vendor’s displays, and will have grooming video tapes playing during the 2 days. Fresh snow has air in it. Your job is to get the air out of the snow so it will adhere better to itself and older (base) snow. This is a time consuming process in which results are often not seen until the next day. It is almost always best to mix older snow with fresh snow-thus just packing (rolling) snow will not do a good as job as adding work with a renovator. 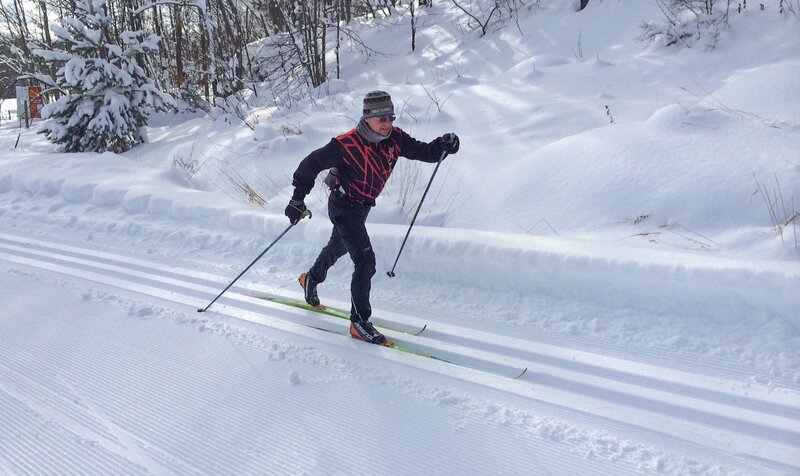 Snow on regularly groomed ski trails will better withstand heat and traffic (skiers) than snow on ungroomed or irregularly groomed ski trails. Best results occur when grooming occurs at or below 32 degrees. Track setting is normally done last if you are doing the full width of the trail. Track setting works best if set the tracks and let them sit overnight before skiers use them. “State of the Art” (2004) Nordic ski trail grooming equipment represents a significant improvement over similar equipment 10 years ago but a dedicated ski trail groomer using older equipment will have more success than undedicated ski trail groomer using ultra-modern equipment. Nordic Ski Trail grooming speeds are normally in the 5-10 mph range. Faster speeds normally do not produce better results. Track setting may require speeds of 5 mph or less! Skidoo Wide Track (24 inch) Skanda is the most widely used snowmobile for Nordic ski trail grooming. Purposes. It also has a known weakness with its generator and reports of it blowing up exist. There is a growing trend to utilize a second battery (secured in the rear rack area of the snowmobile) to run the various electrical actuators found on ultramodern grooming equipment. Ultramodern grooming equipment has 2-3 electric actuators and manufactures are exploring the possibility of adding more in the future. You will need to learn how to wire in the implements to this second battery. If you use the accessory outlet on your snowmobile to run the electrical implements on the grooming machine, expect fuses to blow and items on your snowmobile to malfunction. Most experience groomers are adding weight to the front of their snowmobile and adjusting (raising) the height of their rear suspension to improve steering when using an implement off the back of the snowmobile. These operators are also switching to aftermarket skis in which dual or triple carbines or runners are featured. All of these adjustments are normally required when using ultramodern equipment due to the increased length of the ultramodern equipment. Compaction drags usually only work well with snowmobiles when there is less than 3 inches of snow on the trail. Operating costs for a Pisten Bully or similar type of snowcat machine are approximately $65 hour. Snowmobile operating costs have been documented to be one-fifth the cost of using a snowcat. These costs include labor. The goal is to keep the fresh snow under your equipment in an attempt to pack it. If you are pushing the snow out and away from your equipment, you need to make some adjustments to your grooming implement including the possibility of slowing down the speed of your machine! Normally it is best to use multiple passes over the ski trail by first starting in the middle and then alternating sides. This will help the center of the ski trail develop an increased base. Rollers can be used with every new snowfall for packing packing purposes but some groomers prefer to restrict the use of rollers to very early season usage or when the ski trails receive 5 inches or more of unpacked snowfall. The reason behind this? The “Time Factor” is one reason as the use of rollers should be followed with use of other implements. It is felt most other modern implements can easily handle 4-5 or less inches of unpacked snowfall without rolling first. Rolling the trails needs to be followed by use of a compaction drag and/or renovating device in an attempt to further break-down the snowflakes, remove additional air and to level the trails. Use of snow flaps (items attached to the implements that are used to pull snow into the center of the implement) is commonly utilized on modern implements (G2 and YTS). The snow flaps also help “tumble” the snow which break the snowflake down so it can better adhere to other snowflakes and make a harder trail surface. It is best to set “tracks” and let them harden overnight rather than setting tracks at 8:00am. If less than two inches of snow will fall during the day, you do not have to regroom the ski trails. However, if a day long storm is to occur, it is best to groom thru the snowfall in an attempt to prevent producing a hard surface layer over many inches of soft snow. Goal is to scarify a small amount of surface snow. A challenging goal when your ski base is not thick. Experience operators will often resort to home-made items in an attempt to deal with the situation. It is often impossible to set track in low base conditions. Having wide trails allows one to pull snow in off the side of the trails to improve conditions. Just rolling existing snow will lead to multiple “bumps” on your trails. You must scarify and mix this with the existing base to produce satisfying results. Snow can melt from the ground upward. It is important to remove rocks, leaves and branches from your trail system in an attempt to drive the frost/cold further into the ground. These items will act as insulators to prevent the frost from being driven into the ground and will melt the snow from the ground upward even if the air temperature is below freezing. If you cover problem areas of the trail system with logs, hay, insulator boards or wood chips, you are also insulating the ground from the frost and encouraging snow to melt from the ground upward. You should always attempt to cover these items with several inches of dirt and grass seed in an attempt to correct problem areas. 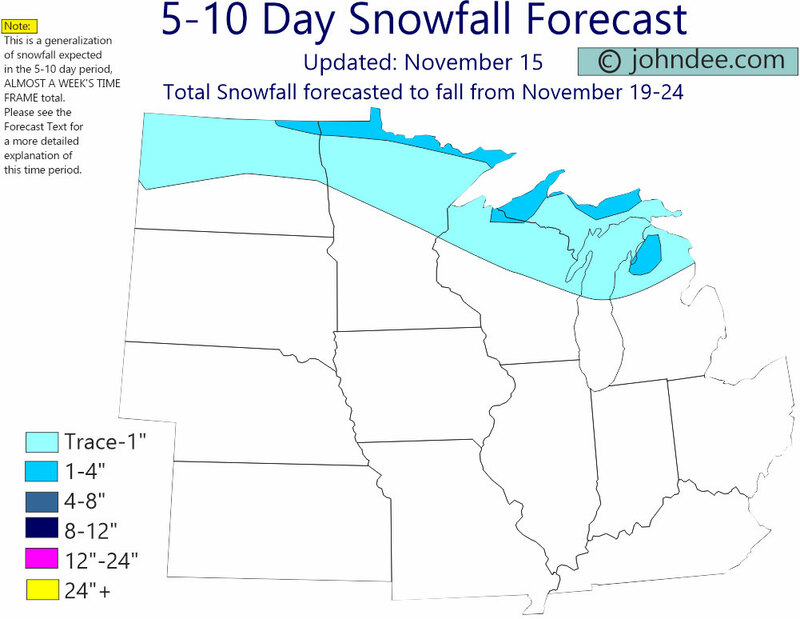 If you leave your trail system covered with leaves and sticks, don’t expect low snow skiing conditions. Off season work strongly effects the condition of snow on the trails. Grooming is expensive at $5.05/mile, make the most of it. Grooming deep snow takes many passes with a snowmobile. Roll snow with a roller with ridges to farm snow blown across the trail. Conserve snow on the sides of the trail for when you really need it. Don’t groom your snow too hard, too fast. The “Shovel” is your best friend when you get stuck. The most dense part of the trail is where your groomers tracks go, alternate this position. Pull dry snow up from deep down when you have icy conditions. An ugly shallow scratched in reset track is safer than an old icy, firm, pretty track. Why groom? Let it get skied in! The heated “Race Building” had tables for vendor’s displays, and had grooming video tapes playing during the 2 days. Vendors had over 80 pieces of grooming equipment on display and available for test drives. Snowmobile grooming is expensive at $5.05/mile, make the most of it. Why is snow density important and how to measure it. Snowmobiles have a wide variety of turning circles (demo). When do you roll or drag? Adjust your suspension so your machine turns (demo). When not to set a track on a curve, intersection or hill. How speed relates to the grooming operation. A hardpacked icy surface can be groomed inot a skiable suraface (demo). How to set tracks in a thin base. The “Shovel” is your best friend when you get stuck. (“hands on” demo). How much weight is optimum for tracking. The most dense part of the trail is where your groomers tracks go;’ alternate this position. How to know if your fan cooled snowmobile is hot. Wire actuators on your snowmobiles to optimize your implements efficiency. Safety is a top priority in grooming and trail design. When to groom….. and when not to groom. What liquid cooled machines work for grooming and why? Mount your electric actuators switches in a convenient location and fused. What a skier likes for a track position on the trail. Tests were conducted by grooming clinic participants in a hard surface controlled test. 2 people were used on the machine to simulate pulling a load. Circles were measured to the outside ski center skag.